Stories about social good, brought to you by Social Good Strategies. This month, our CEO, Kate Azar, was quoted in an article about making sure your donation to a charity counts. The article, which focuses on National Breast Cancer Awareness Month, points out that those cute pink ribbons and pink products you see all around are not regulated. Meaning that anyone can use them. So, donor beware! Just because your favorite product - or your favorite football team - is pink this month, doesn't mean they are giving money to a good cause. Do your research -- You'd be surprised how many people don't even look at a nonprofit or charity's website before giving money. Whether you are giving $10 or $100,000, it's important to know how your donation is being used. Also, there are roughly 1.5 million nonprofits in the US alone - many of which work to fight breast cancer. Researching at least a few national charities and some local organizations should be standard practice. A good nonprofit website will tell you the impact that the organization has made in the past, or at least their goals for this fundraising campaign. It is also much more rewarding to find a charity that speaks to you, your values and your interests. With a little research, you can better understand the impact your contribution has made to the cause. Start a donor circle -- No donation is too small to make a difference (ask President Obama's Presidential fundraising team), but if you gather your friends, family or coworkers to pool together funds for a larger gift, you can make a bigger impact. Giving circles are a popular tool for smaller donors to make bigger contributions to a cause. And the charitable recipient will be grateful for your initiative. Many nonprofit fundraising teams are stretched thin, so it's impossible to have a personal relationship with each donor, but when you gather a circle of community members and boost your donation, you're more likely to receive feedback from the nonprofit and have more influence in how your gift is used. Consider hiring a philanthropy advisor -- If you're making a single, small direct gift, a philanthropy advisor might not be for your. But if you are engaged in annual giving, donating a large cash gift or are interested in donating any non-cash gifts such as property or stocks, a philanthropic advisor can really help you find the right cause, explore options for giving your time, talent and treasure, and broker a long-term relationship that will benefit both the donor and the charity. Hey Boomers: What's next after you exit your business? You've had a long and successful career. Maybe you've climbed the ranks to the C-suite or you've built a company from the ground up. You've accomplished so much, but you suspect it's time for the next chapter. Sure golf and travel sounds great, but you aren't quite ready to be put out to pasture. So what's next? We work with clients to find an answer to that exact question. We believe that philanthropy can be that next rewarding adventure. You have earned so much valuable experience and knowledge from your career... something that most nonprofit and charitable organizations would greatly benefit from. The nonprofit industry faces a troubling dilemma. Due to the inability to pay competitive salaries, they cannot attract the much-needed, top talent in from business world. (See Dan Pallotta's TED Talk for more on the misguided ideals that limit nonprofits from making any large-scale global change.) But a non-profit needs the same business skills that a for-profit company needs. This is where retired executives can play an important role. Serving as advisors, Board Members, volunteers and strategic donors, individuals (retired or not) with valuable business acumen can take a non-profit to the next level. But, as Bill Black, certified exit planner, financial expert and host of Exit Coach Radio asked SGS CEO Kate Azar in an interview (full interview below), how does one find a social cause that is really meaningful to them? This is where we come in. At SGS, we look at a client's past philanthropic activity. Where has our client donated to, volunteered or which Boards do they sit on? Which of these activities have been because a friend or colleagues asked for their contribution and which are because the cause was really meaningful to the individual? We also ask about our client's values. What legacy does our client want to leave behind? What values do they want to pass on to their children and grandchildren? And finally, what keeps our clients up at night? Do they read or watch the news and see an issue that really makes them mad.. or gets them excited? These questions help us to get to the core of our client's motivations in philanthropy and help us to match them to a social cause that is meaningful, exciting and in line with our client's values. How can you help suffering refugees? Being an intern for a company or specific person is a murky concept. You don’t really know what is to be expected of you, what your role will be, if you will make a difference or if you’ll just be getting coffee and answering phones like popular culture has led us to believe. Being a virtual intern is even more vague. But as I learned from interning with Social Good Strategies, it can be extremely valuable. I spent the majority of my time doing, really what I wanted. Kate and I sat down at our first meeting and discussed what I wanted out of this internship and what she was looking for from me as the intern and then made a list of shared goals. As the only employee for a company that was not yet a year old, she wanted not just an intern, but someone she could bounce ideas off of and help her on her journey of finding the solid ground her company belonged on. As a first time intern, I wanted to work for someone that I could learn from and would take me seriously as someone whose opinions mattered. Through this internship I learned an impressive amount about giving, especially in the Orange County area. I learned about so many incredible organizations that are working diligently to make this world a better place, I learned once more how vital a little help is to people in need, and I learned what it means to be a woman starting her own business and maintaining on in uncharted territory. It was an amazing experience, interning for Social Good Strategies and especially seeing Kate create her own path, inspiring my future in the best way possible. I cannot wait to see how Social Good Strategies develops and all the remarkable giving that comes from the efforts of Kate Azar and her clients. Shanti is a 4th year student at The University of California, Irvine. She interned with SGS for the Summer 2015 term. Learn more about the SGS internship program, including how to apply, by clicking here. 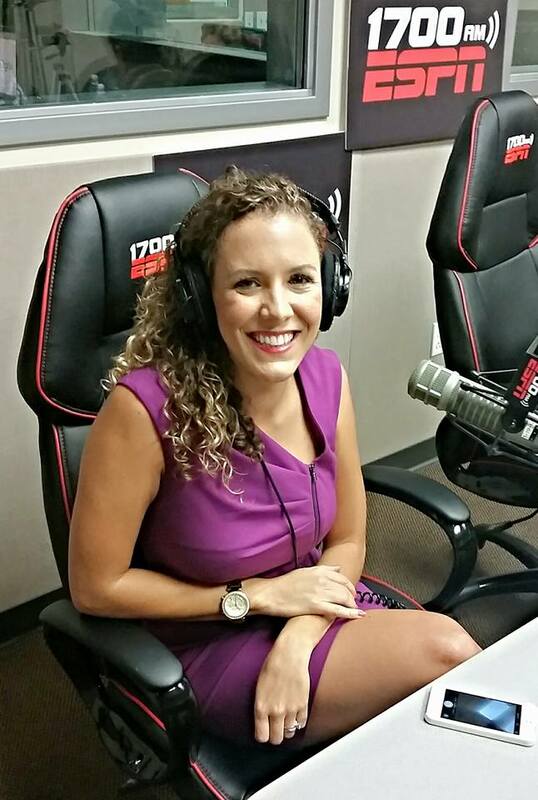 Social Good Strategies CEO Kate Azar was featured on ESPN Radio's Real Talk San Diego to discuss her work advising successful and corporate clients on their philanthropy. If you missed the live broadcast, you can listen to it here. "Real Talk" features community business leaders and entrepreneurs sharing their insights and opinions on business, finance, real estate, political and lifestyle related topics that impact our communities. The Chronicle of Philanthropy (CoP) published new data highlighting the mismatch between affluence and need nationwide. The data, based on CoP's How America Gives study, compares giving behavior with quality-of-life measurements in more than 2,700 counties across the U.S. Past studies have shown that those with lower income give more per dollar -- according to CoP's data, households that earn $50,000 to $75,000 give an average of 7.6% of their discretionary income to charity, whereas those who make $100,000 or more only give about 4.2% (though, we should note that the total amount people in wealthy areas give is often larger than the amount given by those who live in less affluent counties.) Indeed, CoP's latest data shows that residents in more affluent areas (those with higher standards of living, low poverty and low crime) give less to charity than those in less affluent areas. Orange County follows suit with this trend. In CoP's interactive map, one can see that Orange County's opportunity index (a measure of economic well-being) is well above average (57.5%) whereas its giving ratio is at the bottom (only 2.8%). To articulate this in a more tangible manner, in April, the Orange County Register published an article stating that, while Orange County is well known for its affluence, 1 in 4 residents live in poverty - that's a stunning 24.3% of residents, giving the OC one of the highest poverty rates in the state. This data makes clear people in wealthy communities are missing opportunities to make a positive impact in not only their neighbors' lives, but that of their county as a whole. With government funding for affordable housing and other social services being drastically cut, philanthropy must pick up the slack. As they say, a rising tide lifts all boats. More philanthropic investments could lower crime, poverty and the need for tax funded social services across the county. "When it comes to volunteering, if it’s hard to find an organization to volunteer with, you might not do as much. When it comes to donating money, I think probably the same factors are taking place." As an advisor, I often hear the same grievances from my clients. In fact, there is a common adage about how hard it can be to give money away responsibly and effectively. Consider that there are an estimated 1.5 million nonprofit organizations in the U.S. alone. Also, consider the latest news of some of our nation's most treasured and well-established nonprofits and the scandals of mismanagement (see Pro Publica's groundbreaking story on the Red Cross's failures in Haiti). It's no wonder donors are unclear about where to give their time, talent and treasure. It's not an easy landscape to navigate. Another problem may likely be that those in affluent communities are unaware of the plight of their neighbors, whereas lower income residents identify with the challenges facing the less fortunate in their community and are therefore more likely to give. "Social capital and neighborly empathy are sometimes missing in wealthy counties, where a veneer of affluence may mask struggling residents and persuade people there’s no need to donate to social-service organizations." This is where we see the role of philanthropic advisors can add value in boosting the overall culture of philanthropic giving. We research and map out the landscape of social issues, identifying the core issues, theories of change, and key stakeholders. Then we work with our clients to make sound philanthropic investments based on this research. We know that when donors feel confident about where their charitable gifts are going, when they have well-informed advisors for their philanthropic investments (just as they do for their other financial investments), they are more likely to give more to the causes that truly need it. Social Good Strategies, LLC is committed to growing that culture of philanthropy in Orange County and beyond. I often find myself explaining what a philanthropic advisor does. People are always interested in the job, much for the same reason I love my work. After all, I get to help people change the world! While the philanthropic advising industry is not new, there aren't many people offering these types of services. In the US, there are more than 260,000 financial advisors available to help people make sounds financial investments, but there are fewer than 1,000 professionals available to help the public make wise philanthropic donations. That number is astonishing given that there are more than 1.5 million nonprofits in the US alone. So, what does a philanthropic advisor do? Many of us have financial planners, investment or wealth advisors to guide us in our financial investments. Similarly, a philanthropic advisor helps you define your values and dreams for the world and build a philanthropic strategy for accomplishing those goals. At Social Good Strategies, we help you decide where your philanthropic investments should be made to create the intended impact. Together, we identify your values, draft a mission statement, and get clear on what success looks like to you. Then we help you identify philanthropic opportunities that align with your goals and values. We make sure you have the information you need to make sound philanthropic investment decisions and track your results. Certainly, a philanthropic advisor isn't for everyone but philanthropic strategy should be. Whether you are giving away $1 thousand or $1 million, you should be thoughtful about the impact your money makes. A philanthropic advisor can help you be more effective in your giving. Read more about the services we offer here. Many people ask me what I mean when I talk about "strategic philanthropy." There are many varying definitions for the term, including a common association with corporate philanthropy. But when it comes to personal or family philanthropy, being strategic with your philanthropic planning means to do so with design and planning backed by research, specific and measurable goals, indicators of success, all to have a measurable impact. I often contrast the concept with what we call "checkbook philanthropy," wherein one gives to causes ad hoc with little further communication or follow up on the part of donor or the nonprofit recipient. Most of us give small amounts (or maybe large amounts) here and there when a friend or charity makes an appeal. An example of this would be to buy a chocolate bar from a kid outside the grocery store to support his baseball team, sending $20 in response to a charity mailing, or donating to a friend's charity walk. There is nothing wrong with this type of giving, every little bit helps (see President Obama's fundraising campaign!) but this type of giving probably won't be as transformative as one or two larger planned gifts. Also, this type of giving can often leave a donor feeling unsatisfied as we are left with little feedback as to how our contribution really impacted the cause. Another fun phrase in the philanthropist's lexicon is "drive-by philanthropy," a term I borrowed from Attorney John Fraker and his podcast Family Philanthropy Radio. He describes "drive by philanthropy" as a situation in which a family foundation or donor gives to so many causes that they are really not able to be truly engaged with any cause. Often, I advise my clients to pick 2-3 causes to engage, as opposed to many, allowing them to make a more significant impact in these issue areas by really delving into the issue and getting to know the cause, and its stakeholders well. I help my clients find a handful of causes that are important to them. Together, we explore theories of change and action. We come up with a personal mission and find partners, nonprofits and charities that align. We really listen to the players and other important stakeholders and explore how we can best make an impact. We ask nonprofits and charities what they really need and how our client's time, talent and treasure can be most helpful. We track the results of our client's giving, and tell the story of how their contributions made a difference. Then we plan for the next year based on what we've learned -- what worked, and what didn't. This is one of the benefits of strategic philanthropy and, in my opinion, the most effective philanthropy. Another benefit of having an annual philanthropic plan, when you get those "drive-by" requests (the ones that you give to out of guilt, rather than genuine interest), you can politely decline, explaining that you already have all your charitable funds committed for this year but you'd be happy to consider the request next year. Then we can explore whether the cause fits in your personal charitable mission. Learn more about how we build a sound philanthropic strategy here. Social Good Strategies is proud to announce the launch of our client, Donna Bojarsky's ambitious and exciting new venture Future of Cities. Social Good Strategies's CEO, Kate Azar, served as Chief of Staff and Advisor to the project. SGS CEO, Kate Azar; Bob Johnson COO and Co-Founder, Future of Cities, Deborah Brutchey, Executive Director, LA Works, and June Baldwin, Senior Vice President, General Counsel, Corporate & Legal Affairs, KCET at Future of Cities event in Beverly Hills, Calif., June 2, 2015, Photo by Jonathan Alcorn — with Kate Azar in Los Angeles, California. “Cities are recognized as the most important laboratory for a successfully organized society, and ground zero for creative ambition. Los Angeles is an important hub with powerful symbolic value. Yet, it is often overlooked for the role it plays in the world both financially and culturally. We are hindered by a traditionally weak civic fabric. LA is a segmented city lacking a dynamic, engaged and representative leadership cadre. Furthermore, we have precious limited infrastructure to bring forth a new generation dedicated to a sustainable world-class city. This is the perfect time to promote a new kind of civic stewardship representative of today’s Los Angeles – a region of unparalleled diversity, technology, entertainment, media, venture capital, environmental consciousness, and creative capital. On June 2nd, Future of Cities launched with a reception at the home of philanthropists Jeanne and Tony Pritzker with more than 100 civic leaders, philanthropists and activists, including Moby, LACMA's Michael Govan, The California Endowment's Robert K. Ross, President of Disney/ABC Television Group, Ben Sherwood, among others from across business, entertainment and philanthropy. Future of Cities will hold its first public event on October 19th at LACMA's Bing Theater. To attend, join the initiative and receive additional information, you can sign up here. Award winning musician and activist Moby at the Future of Cities event in Beverly Hills on June 2nd. Press coverage of the event below. A full photo gallery from the event can be found on the Future of Cities Facebook page. “Los Angeles has a rather checkered history with the term “civic engagement.” Its disconnectedness seems to translate into low voter turnout for citywide elections or participation in cultural institutions. Hollywood, the industry, seems more apt to portray the city’s apocalypse than its moves toward livability. Social Good Strategies CEO Kate Azar has been selected as a nominee for the Orange County Business Journal's Twenty-First Annual 2015 Women in Business Award. Nominees were judged for their professional and community involvement and leadership. Five exceptional business and professional Orange County finalists will be honored at the Women in Business Awards Luncheon and Program at Hotel Irvine on June 23. On May 25th, the Orange County Business Journal issued a special Women in Business supplement featuring profiles and photos of this years' nominees. National Charity League fosters mother-daughter relationship building through philanthropy and community service. What a great thing to do after that Mother’s Day brunch! MomsRising.org focuses on mother and family related economic security issues such as paid family leave, earned sick days, affordable childcare and childhood nutrition. Healthy Child Healthy World creates educational resources for parents and caregivers so they can make informed decisions to protect the health and development of their children. Human Options is an Orange County based charity that helps abused women, their children and families rebuild their lives. They work with the community to break the cycle of domestic violence. Kiva allows people to lend money to low-income and underserved entrepreneurs to start businesses and support their families. You can even buy your Mom a Kiva gift card so she can choose a woman to lend to. I love giving this gift to the person who has everything. Every Mother Counts supports maternal health programs making pregnancy and childbirth safe for mothers around the world. Americans will spend $21.2 billion on Mother’s Day gifts this year. While Mama certainly deserves to be showered with love and appreciation, imagine how less fortunate mothers around the world could be served with just a portion of these funds. So tell me, how do you honor your mom, grandmother or other motherly figures in your life on Mother’s Day? What do you think about including philanthropy in your holiday? I bet Mom would be proud! On Veterans Day, many are looking for a way to honor and aid the brave men and women who serve our country in the armed forces. Check out Charity Navigator's list of top rated charities that support the soldiers, veterans and their families. It's election day and while it seems as if the midterms don't matter, they do. No matter what your political persuasion.. it's important that you vote. Find your polling place here. (Left to right) Judge Katherine Tennyson, MSNBC's Goldie Taylor, CNN/HLN's Christi Paul, former NFL player Chris Johnson and Beverly Gooden, creator of the #WhyIStayed Movement, discuss public perception about domestic violence. This month, I had the pleasure of working with Verizon Wireless and When Georgia Smiled: The Robin McGraw Revelation Foundation on a summit on domestic violence. October Is National Domestic Violence Awareness Month and it is shocking to learn that nearly one in four women, one in seven men and more than 3 million children in the United States are affected by domestic violence. This summit served as a platform for connecting, inspiring, and healing people on the front lines of the domestic violence provider community. Summit attendees included Robin McGraw, CEO, When Georgia Smiled: The Robin McGraw Revelation Foundation; Dr. Phil McGraw, host DR. PHIL; Christi Paul, News Anchor/Correspondent, CNN and HLN; Chris Johnson, former member of the Super Bowl champions Baltimore Ravens and many more. The day was truly inspirational and touched on many of the issues surrounding domestic violence including the good and harmful role technology can play. Verizon is really leading the way by showing how corporations play a role in domestic violence. Through their HopeLine program, they've donated hundreds of thousands of phones and awarded millions of dollars in cash grants to domestic violence organizations nationwide. Read more about their HopeLine program here. If you’d like to get involved in ending domestic violence, the When Georgia Smiled: The Robin McGraw Revelation Foundation has a number of unique programs addressing domestic violence and campus sexual assault. You can find out more here. If you or someone you know are in an abusive relationship, there places you can go for help. Call The National Domestic Violence Hotline at 1−800−799−7233 or visit http://www.thehotline.org. With people like the Lear's and the thousands of people who stand for climate action (see the People's Climate March), I am reminded of what's possible with the power of passionate people.